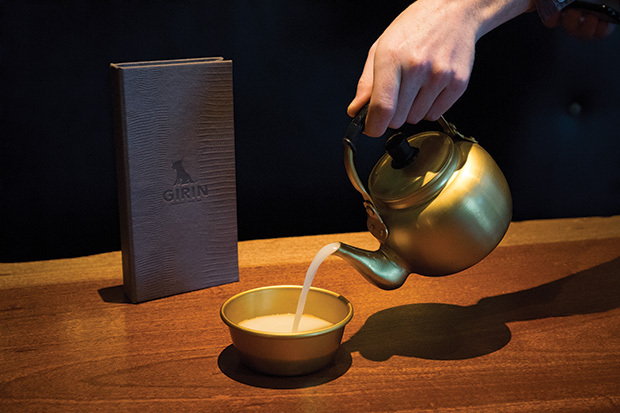 Girin, that refined Korean steak house in Pioneer Square, has two years under its belt. However, the story of how its owners came to know about—and now, to brew their own—makgeolli, a traditional Korean sake-like beverage, started at about the same time they were researching menu inspirations around Seoul in early 2014, long before Girin first opened its doors. Makgeolli is a rice-based alcoholic beverage that goes through the same simultaneous double fermentation process as Japanese sake, meaning the conversions of starch to sugar and sugar to alcohol occur at the same time, instead of in isolated stages as they do in the making of beer and wine. It is unfiltered—giving it a milky, cloudy appearance—and delicately sweet, though the fermentation lends a probiotic tang, similar to that of yogurt, and a light fizz. At 6.5–14 percent alcohol by volume (ABV), makgeolli is less alcoholic than soju, Korea’s more popular spirit. As Korea’s oldest liquor, makgeolli fell out of favor in the ’80s, hanging on only among the rural farming class and the elderly—who praise it for its kombucha-like medicinal properties. But in the past 10 years, makgeolli has experienced a resurgence in Seoul, where hip little bars have started brewing their own and targeting a younger audience.